In 2014, Vice Media, having just moved into its their new offices in Williamsburg, worked with Brooklyn Grange to turn their expansive rooftop into a vegetable garden and recreational space for their employees to enjoy. From the natural meadows to the delicious vegetables, the perks of Vice’s rooftop urban farm seem fairly obviously. But what benefits might this green infrastructure have to the broader environment? Students at The New School are trying to find that out. 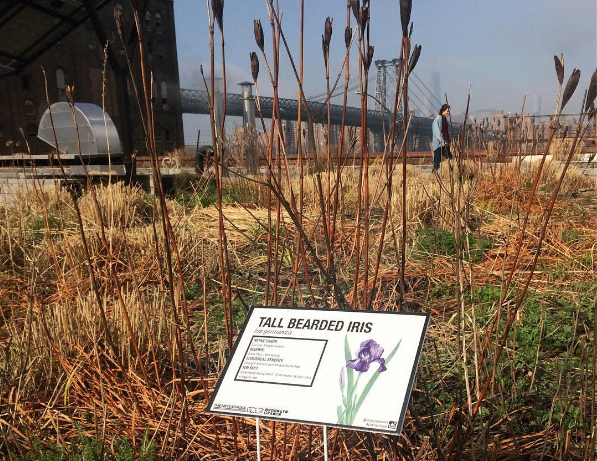 Over the last three semesters, students in the Green Roof Ecology undergraduate course have conducted research at rooftop farms throughout New York City to measure, and think about ways to enhance, the ecological benefits — increased biodiversity, mitigation of urban heat island effects, and absorption of stormwater — of green roofs such as Vice’s. The class — which includes students from Parsons School of Design and Eugene Lang College and is supported by the Lang Civic Liberal Arts program — is a reflection of The New School’s dedication to cross-disciplinary learning, design for social good, and real-world experiences. “In the Green Roof Ecology class, we’ve managed to pull together students who are interested in ecology — very science-oriented students — together with students studying graphic design, information design, communication design, and architectural design all together in one space to really consider how you re-think a green roof,” said Associate Professor of Urban Ecology Timon McPhearson, who teaches the class and co-founded it with faculty member Kristin Reynolds. To learn more, visit Vice Green Roof x New School on Instagram.